Banana is a delicious fruit, found in various sizes and colors but is usually elongated and curved, with soft flesh rich in starch and covered with a rind which may be green or yellow. Bananas consist mainly of sugars (glucose, fructose and sucrose) and fiber, which makes them ideal for an immediate and slightly prolonged source of energy. That's why it is often recommended to athletes before performing regular workout. It acts as a perfect snack for instant energy boost. Due to its mouth watering aroma and delicious taste it is often used in various recipes, including desserts, smoothies and baked goods. This soft, rich creamy and delicious fruit is packed with multiple nutrients and essential vitamins. Banana is a good source of carbohydrates, dietary fiber, Vitamin B6, Vitamin C, and potassium. 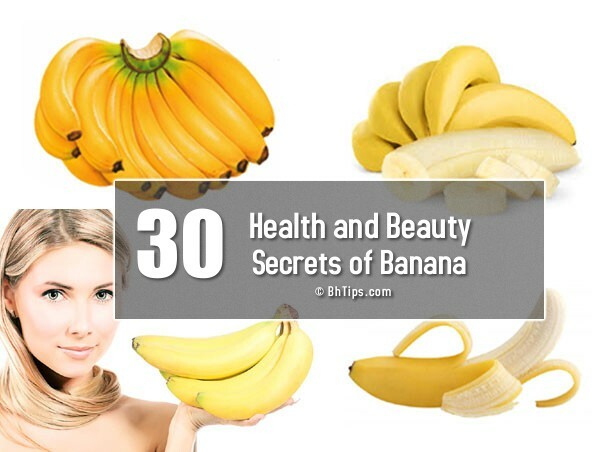 Let's have a look on some best Health and Beauty Benefits of Bananas. High fiber in bananas can help normalize bowel motility and prevent constipation. Pectin present in Bananas, help to alleviate constipation and improves bowel function. Bananas helps a lot to relieve stomach ulcers by coating the lining of the stomach against corrosive acids. Certain substances in bananas stimulate the cells which make up the stomach lining, this enables production of a thicker protective mucus barrier against stomach acids. A substance known as protease inhibitors in banana, help getting rid of bacteria in the stomach that produces stomach ulcers, thus protecting against damage of stomach and ulcer. Fully ripe bananas help regulate bowel movement and help a lot in curing piles as well as constipation. You can mash a ripe banana and mix it with some milk. Have this mixture at least 3-4 times day to get relief from the pain of piles. Raw bananas are astringent in nature and are effective in treatment for diarrhoea. Bananas are soothing to the digestive tract and help restore lost electrolytes after diarrhea. They also regulate fluid balance. Banana improve the performance of digestive track. Banana is rich in the substance known as fructooligosaccharide which acts as a probiotic (friendly bacteria). It stimulates the growth and activity of probiotics in the colon and produces enzymes that enable absorption of nutrients thus enhancing the digestive ability and preventing unfriendly bacteria from harming the body. Rich in antioxidants and dietary fibre, consumption of bananas reduce risk of bowel cancer. Recent scientific research has proved that persons who regularly consume at least 3 servings of fruit per day, have less chances of developing age-related macular degeneration, the primary cause of vision loss in older adults, compared to persons who consume less than 1.5 servings of fruit daily. Studies indicate that regular intake of bananas in daily diet helps reduce the occurrence of stroke and this is due to the high amount of potassium. Banana is a rich source of B vitamins and therefore boosts nerve function. Potassium, in banana improves mental faculties and enhances learning abilities. Probiotic bacteria present in bananas have the ability to absorb calcium in the body. Hence, consuming bananas help in building better bones. After consuming bananas they provide instant energy to body. It does this by converting the natural sugars into energy instantly and this is one of the reasons sportsmen consume it during intervals. Bananas are an excellent breakfast for kids and adults as it provides required energy throughout the day. Pectin which is a soluble fiber in banana helps to lower Cholesterol level. Soluble fiber in banana, helps slow the absorption of cholesterol and sugar in your bloodstream, reducing LDL (bad) cholesterol and blood glucose levels. Potassium present in banana keeps blood pressure under control and improved consumption of calcium, potassium and magnesium can also help decrease high blood pressure. Bananas are rich in potassium, calcium & magnesium, so it is a healthy option for regulating blood pressure. Bananas are good for Anaemic patients as they contain high levels of iron which help regulate the haemoglobin levels in the body and help a lot to cure anemia. Vitamins B6 and B12 along with magnesium and Potassium in Bananas helps recover from nicotine addiction and speed recovery from the effects of smoking withdrawal. Banana is also very helpful in getting rid of hangover and relieve morning sickness. A mixture of Bananas along with honey and yoghurt helps a lot to recover from symptoms of hangover. Note: Drinking alcohol is hazardous to health So better to avoid alcohol. Bananas are rich in amino acids known as Tryptophan. This substance triggers production of melatonin (sleep hormone) which induces sleep. Eating banana a few hours before bedtime help a lot to get a peaceful sleep. Mineral deficiency often cause muscle cramps. Banana is a rich source of potassium and protect against muscle cramps during workouts and night time leg cramps. Itching and swelling caused by bug or mosquito bites can be reduced by rubbing the inside of a banana peel on it.Rub a bug or mosquito bite with the inside of the banana peel to relieve itching and irritation. Bananas being a rich source of potassium, if consumed regularly in moderation, promote renal health and prevent kidney cancer. Bananas are excellent food for weight gain specially for thin and under weight persons. Banana milkshake enhances weight gain quickly. Bananas provide the body with necessary natural sugars and milk provides protein, both are important for healthy weight gain. Bananas are high in potassium, which helps normalize the heartbeat and regulate the body’s water balance. During periods of high stress, our body’s potassium levels decreases rapidly: eating bananas is a healthy way to rebalance them without using drugs. the wart.Bind your wart with a banana peel. Cut out a section of the peel so it's slightly smaller than the tape you'll be using. Rub the inside of a banana peel onto the wart and then secure with duct tape. Keep it on the wart for a day before removing. Repeat until wart is fully removed. Bananas contain potassium, natural oils, carbohydrates, essential vitamins. Bananas not only promote healthy scalp but also prevent dandruff. Natural oils present in banana not only promote hair growth but also help in softening hair, protecting its natural elasticity, prevents split ends and breakage. Banana is a great natural moisturiser for your skin. The Vitamin A present in banana restores the lost moisture and repairs the damaged, dull and dry skin. To instantly moisturise dry and dull skin, you need to follow the given instructions. Mash a ripe banana and apply it on your face and neck. Leave it on your skin for 15-20 minutes. You will feel a baby soft and supple skin. Banana is an excellent natural anti-aging food and prevent premature fine lines and wrinkles. Nutrients in banana helps in fighting wrinkles and keeps the skin youthful. Due to its wonderful anti-aging properties, banana is used in various skin masks and packs to cure wrinkles and fine lines. To prevent and get rid of wrinkles at home you need to follow the given instructions. Take a pulp of 1 fully ripe banana and mix with few drops of olive oil. Apply this mixture on the wrinkle affected areas specially under eyes, around mouth and over neck. Let it stay at least for 20 minutes and then wash off. Banana also help a lot to get rid off puffy eyes. Potassium rich banana draws out excess fluid from under your skin and reduces the swelling immediately. To get rid of puffy eyes you need to follow the given instructions. Mash half a banana and apply generously around the puffy eyes. Rinse off with cool water. The puffiness will vanish instantly. The wonderful moisturizing property of banana can be used to get rid of cracked heels. All you need to follow the given instructions. Mash the pulp of 1 ripe banana and apply this pulp on clean, dry heels. Leave it on for 10 minutes and rinse the feet clean. The banana pulp will penetrate deep into dry, cracked skin to create soft and supple heels. Regular application will give you excellent result within few days.